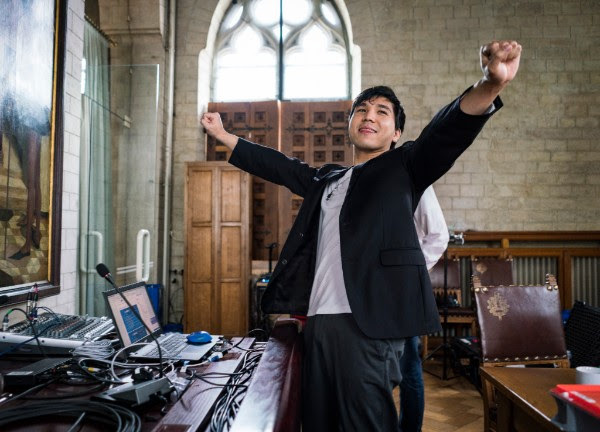 After a dramatic day, Wesley So won Your Next Move, thus collecting 13 Grand Chess Tour points and $37,500 for his efforts. The American started and ended the day on top, but the standings don’t tell the full story of an event. 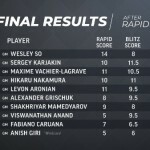 The tournament was a tight race between Wesley So, Maxime Vachier-Lagrave and Sergey Karjakin until the very last round when the winner of the tournament was decided on a small margin. 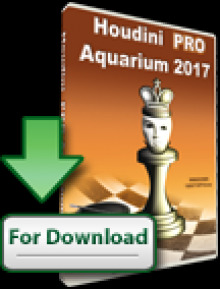 Vachier-Lagrave and Karjakin tied for second place, both collecting 9 Grand Chess Tour points and $22,500. 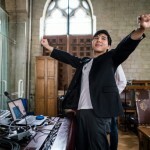 The end of the event was the most dramatic one in the Grand Chess Tour series! So started the day with a comfortable 2.5 point lead but by round 13 Karjakin caught up to him while Vachier-Lagrave was only half a point behind. Going into the penultimate round, the leader lost his games while both of his rivals won theirs. 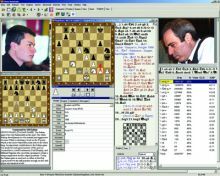 Entering the last round, So was still half a point ahead but had the black pieces against his fellow American Hikaru Nakamura. Shortly after the opening, So found himself in a lost position. Lucky for him, both Vachier-Lagrave and Karjakin lost one after another! Wesley had only seconds left on his clock and was unaware that he had already clinched the title. He went on to lose his game, and only after the fact he found out that he was the victor after all. Maxime Vachier-Lagrave had a very strong showing and it seemed as though he would leapfrog the leader at some point. His performance in the first half of the day was very impressive with 3.5/4 but became shakier in the second half. 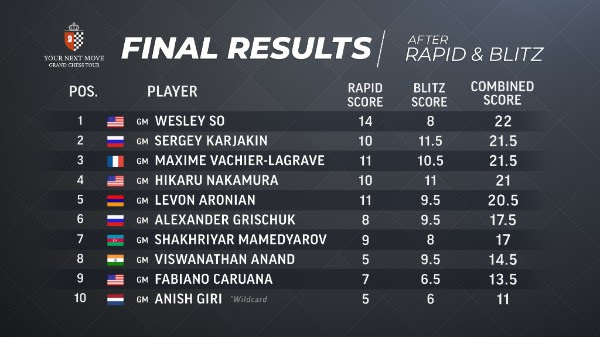 Sergey Karjakin, who dominated day one of the blitz with 6.5/9 was not able to show the same form today and lost key games in the second part of the day. Both players had the opportunity to tie with the leader were it not for their last round heartbreaking losses. With the last round win over the eventual winner, Hikaru Nakamura secured his fourth place, collecting 7 tour points and $15,000. Levon Aronian’s last two round losses cost him quite a bit of money and tour points as he finished in fifth place, with 6 points and $12,500. 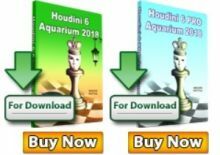 The Armenian finished 1.5 points behind the winner and was in contention for the title until the penultimate round when he lost a key game to Vachier-Lagrave. There will be little rest for the players, as the second leg, Paris Grand Chess Tour, starts in just three days. Anish Giri who was the wildcard in Leuven will be replaced by Vladimir Kramnik who cannot compete for tour points. The rest of the field will keep battling it out for the top four places to qualify to London.